Trayvon Martin case: Did George Zimmerman’s lawyers violate the American Bar Association’s ethical guidelines? No matter whose side you’re on, you should be troubled by the shocking behavior of Zimmerman’s former attorneys. Florida special prosecutor Angela Corey says she is about to charge George Zimmerman with the shooting of Trayvon Martin. (Update: Corey just charged George Zimmerman with second-degree murder for the shooting of Trayvon Martin. Zimmerman has been taken into custody: He’ll have a bond hearing soon.) What a relief: The place for determining whether or not Zimmerman shot Martin in self-defense, as he claims, is open court. Under Florida’s Stand Your Ground law, Zimmerman is entitled to a hearing before trial so a judge can determine whether his self-defense claim holds up, before he even has to go before a jury. I hope Zimmerman now finds himself a good lawyer. (Update: Criminal defense attorney Mark O’Mara is now representing Zimmerman; he said Wednesday night that his client would plead not guilty.) In publicly parting ways with him, his old ones have served him badly. Their actions will be overshadowed by Corey’s announcement. But the crazy TV interviews they gave on Tuesday and Wednesday are worth pausing over. The headline from those interviews was that Zimmerman’s lawyers said he’d gone rogue. 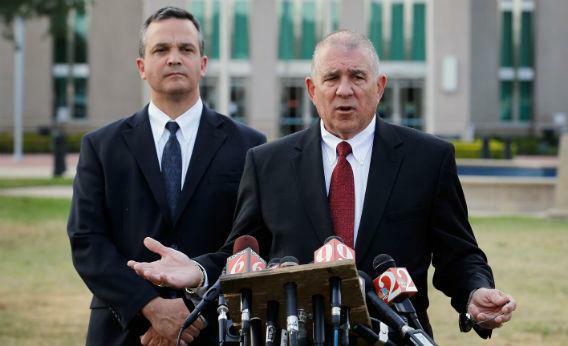 “I can’t ethically go forward and say that I’m representing George Zimmerman when I haven’t talked to him in a couple of days and he’s giving interviews, apparently,” his former attorney Craig Sonner said Tuesday. As a matter of legal ethics, though, it’s Zimmerman’s lawyers who seem to have gone off the reservation. The rules for confidentiality in the context of a lawyer-client relationship are unequivocal. The American Bar Association’s rules for professional responsibility state that “a lawyer shall not reveal information relating to the representation of a client unless the client gives informed consent.” (There are also a few other circumstances that don’t apply here—for example, a lawyer can talk about the representation if he thinks his client is about to kill or hurt someone, or if the client is suing him.) The Florida bar has adopted a version of the same rule. The duty of confidentiality extends beyond the time of the representation—forever. Lawyers have had anguished battles with themselves over whether to reveal that a client told them that he committed a crime someone else was convicted for, even after the client’s death. And yet, here come Sonner and Hal Uhrig, breaking off that representation on television in a series of statements that reveal all kinds of confidential information that could potentially hurt their former client. The lawyers said Zimmerman, who killed Martin in February and has made an embattled claim of self-defense, was “not doing well emotionally” and “may not be in complete control of what’s going on.” They also said, taking umbrage, that he’d called Sean Hannity without going through them. Maybe it’s not a good sign if Hannity is your lifeline, but Zimmerman has the right to talk to anyone he wants. Uhrig and Sonner seemed most concerned that Zimmerman wanted to talk directly to special prosecutor Angela Corey on his own. Yes, that’s odd and probably a bad idea—Corey reportedly said, wisely, that she would only talk to Zimmerman with his counsel. But this is not a fact that Zimmerman’s lawyers should be making public. Since the lawyers also said that Zimmerman hasn’t been calling them back, it’s very hard to see how he could have consented to their amazing release of information. Uhrig and Sonner have company, of course, in bizarre lawyer land. Joe Amendola, who represents Jerry Sandusky, the former Penn State football coach charged with child sexual abuse, offers an infamous recent example. Like Zimmerman’s former lawyers, Amendola grabbed the spotlight, putting his client on television for an interview that could weaken his defense at trial. The attention to the case turned up the fact that Amendola had a baby in 1997 with a teenage client, who he later married and then divorced. After a party for reporters at Amendola’s house last December, who according to TMZ were “vying for an exclusive interview” with Sandusky, an NBC correspondent was arrested for drunk driving. And this week a judge issued a gag order in the Sandusky case for lawyers on both sides, after Amendola and the prosecutor took public shots at each other. And yet even with that laundry list of questionable lawyering, it seems to me that Uhrig and Sonner are in a different category of client harming. Breaking the legal ethics rules isn’t the same as breaking the law—lawyers can’t be prosecuted for this. But they can become the subject of a complaint to their state’s bar and potentially set themselves up to be sued for malpractice. If you’ve already written off the legal profession as a source only of bad jokes, then I suppose you can shrug off the apparent rule breaking of Zimmerman’s lawyers and the questionable judgment calls of Sandusky’s. But lawyers are officers of the court who have pledged to follow the rules of their profession. They also claim important privileges based on their duty of confidentiality—for example, they’re rarely called to testify based on what they learn in the course of representation because, of course, they’ve solemnly promised to keep it confidential. When a few lawyers break the rules, they blow it for the whole profession. Especially in a high-profile case like this. Whatever you think of George Zimmerman, now that he’s about to face charges, he deserves better lawyers than the ones who just quit on him.